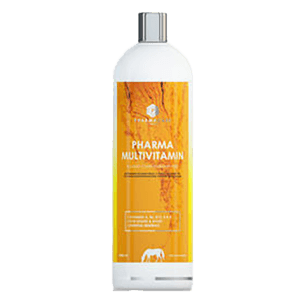 A liquid complemetary feed containing essential vitamins and minerals. 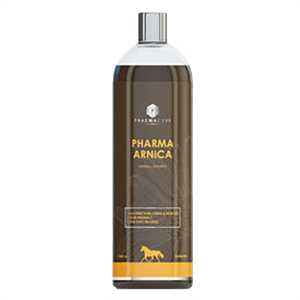 A sweet-tasting vitamin and trace element solution containing essential nutrients for leisure and sport horses. Ingredients: Ingredients: Water, glucose, emulsifier, sweeteter, vitamin and trace element premixes, citric acid. Koostumus: Vesi, glukoosi, emulgaattori, aromi, vitamiini- ja kivennäisesiseos, sitruunahappo. Cu (kuparisulfaatti) 1200 36 mg.
Co (kobolttisulfaatti) 16 0,48 mg. Se (natriumseleniitti) 6 0,18 mg.
Fe (rautasulfaatti) 1300 39 mg.
Dry matter / Kuiva-aine 20,64%. crude protein / raakavalkuainen 0,67%. Crude fibre / Raakakuitu 0%. WARNING: Store in cool dry place, out of direct sunlight. Protect product from freezing. Keep out of reach of children. 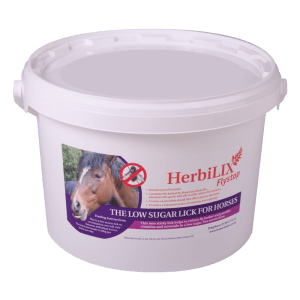 Recommended dosage: 20-50 ml/day depending of the horses size, level of exercise and other feeding. Alternative doses should only be given at a veterinarian’s directive.